Description: The award aims to encourage studies by Hampshire students pursuing Division II and III projects in journalism; documentary photography, film, or video; international relations; globalization; peace-building; civil society; and human rights. Student research that has been supported by the Sander Thoenes award includes the study of the health of undocumented migrants; fieldwork in Senegal focused on the accountability of NGOs; an investigation of the political implications of oil politics in Central Asia; a study of the Sri Lankan civil war; and a conference presentation of research on women in Morocco. Award: Awards amounts are approximately between $300 and $1,000, and funding will be paid upfront, once an application is accepted. The last $100 will be paid upon receipt of your project report. Purpose: This award typically covers travel-related expenses, necessary materials and supplies, and sometimes equipment, which needs to be returned to Hampshire College upon completion of the project. Application Deadline: Thursday March 28, 2019 at 4 p.m.
CS funding is available for Div II and Div III students. In some cases, Div I students interested in summer research can apply. You must be a current student at the time of the research project/internship. Graduating students are not eligible. Applications will be evaluated on the intellectual merit of the proposed work and the necessity of the budget items, as justified in your proposal. Applicants must have the support of a faculty supervisor or mentor. Grant recipients are expected to submit a final report prior to the grant ending. If you plan to be on leave, it must be a field study leave and not a leave of absence. Projects must not yet be completed upon request for funding. Conference-related expenses will not be paid retroactively. You must be in good academic and good disciplinary standing. The application process is competitive, and all applications may not receive funding as funds are limited. If you are an international student, make sure to visit the office of multicultural and international student services to confirm that your research project is compatible with your visa status. If you plan to pursue your research abroad, the global education office provides information on visas, immunizations, etc. and offers resources for field study in the U.S. or abroad. Introduction: Describe the purpose of your proposed research. You should demonstrate that you have thought critically about the research and methodology or project plan. State the specific aims or research questions of your project. Methods: Describe how you plan to accomplish the project or execute the research. Timeline: Describe the proposed time frame for the project and when major milestones begin and end. Outcomes and/or Implications: Discuss the relevance of this research to the field and implications for future investigation. 3. Complete budget in Excel format listing each item, its cost, including shipping and tax, as well as justification. 4. A letter of support from your Div II or III chair. Please compile all documents listed in the cover page as one file (Word or PDF) and email your complete application by March 28, 2019 at 4 p.m. to Kelsey Finnell, CS grants coordinator (kafNS@hampshire.edu). All applications must be submitted on time and include all four documents listed above. Incomplete applications will not be accepted. Applications will be read by several screeners. The screening process usually takes a couple of weeks, and award decisions are made twice a year, at the beginning of the semester. As a grant recipient, you will receive the funds up front by check so that you can purchase the items and material listed in your budget. Kindly keep all original receipts for tax purposes. The last $100 of the award will be paid upon receipt of your report. Recipients of Thoenes grants are required to write a project report. Papers, published abstracts, conference posters, or notices of the work should be attached to the report. You will also occasionally be asked to give presentations of your work. We encourage you to take photos during your project to promote the Thoenes grant to donors and for display on the Cognitive Science website, newsletter, brochures, flyers, etc. For any questions re. the Thoenes Scholarship Fund, please contact Jane Couperus at jcouperus@hampshire.edu. Sander came to the College in 1987 from his home in the Netherlands. After concentrating in Soviet politics and journalism, he produced a highly original Division III study, "Between Glasnost and a Free Press: Soviet Journalism in the Gorbachev Years," that relied heavily on primary research Sander conducted in Moscow. He went on to report from dangerous, unsettled places where human rights were in jeopardy, including Russia and the former republics of the U.S.S.R. He was then Jakarta correspondent for the Financial Times of London. In September 1999, Sander was killed by Indonesian soldiers as he entered Dili, East Timor, to report on Timor's United Nations-sanctioned vote to separate from Indonesia. Sander's reporting also appeared in the Christian Science Monitor, U.S. News and World Report, and various other North American and European news media. Sander's death was noted by many admirers, not least Kofi Annan, then secretary general of the United Nations, who said, "It is largely thanks to the courage and determination of men and women like Sander that crimes against humanity are brought to the attention of the world's conscience." 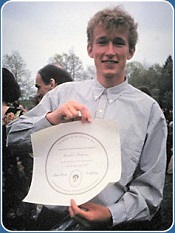 Sander was recognized posthumously by the National Press Club, the Overseas Press Club of America, and others. See Sander's Memorial Page for more information about him. Interested in learning more about Sander Thoenes? Sander's biography: The person, his work, and the impact he left. Alum Akil Gibbons 12, recipient of the Thoenes award, premieres his Div III documentary film Paper City at the Global Peace Film Festival. If you are looking for a different kind of research grant, visit CORC's Fellowships, Grants, and Scholarships page.